The published Merit List dated 02.08.2017 for PG Admission in Geography (against 40% seats) has been revised due to detection of technical fault. Inconvenience caused is regretted. Applicants of the merit list are hereby directed to report to the department of Geography on 08.08.2017 (Tuesday) between 1:00 pm 2:00 pm with all necessary original documents. Admission will be strictly on the basis of marks obtained in Entrance Examination 2017, present on that very day and time. Admission against 60% seats of C.U. candidates will be held on 29.08.2017 (Tuesday) and 30.08.2017 (Wednesday).Candidates are instructed to bring all necessary original documents. The shortlisted applicants of the merit list are hereby directed to report to the department of Geography on 1.08.2017 between 1.00p.m. to 2.00p.m. with all the necessary original documents. Admission will be strictly on the basis of marks obtained in the B.A. /B.SC. Examination, 2017 present on that very day and time. 1.08.2017 (Tuesday) between 1.00p.m. to 2.00p.m. The shortlisted applicants of the merit list are hereby directed to report to the department of Geography on 31.07.2017 between 1.00p.m. to 2.00p.m. with all the necessary original documents. 31.07.2017 (Monday) between 1.00p.m. to 2.00p.m. The short listed applicants of the merit list are hereby directed to report to the department of Geography on 26.7.2017 (Wednesday) between 3:00 pm 4:00 pm with all necessary original documents. Admission will be strictly on the basis marks obtained in the B.A/B.Sc Examination,present on that very day and time. ** Admission against 60% seats of C.U Candidates (after reporting) will be held on 27.07.2017, 28.07.2017. Following bonafide applicants (60% seats category) of the waiting list (reporting held on 16.08.2017) are hereby requested to report the Department of Zoology (Asutosh College Main Building) on 20.09.2017 between 11.30 A.M. – 12.30 P.M. Candidate who will be selected (on the basis of merit) shall have to take the admission on that very day (20.09.2017). Following bonafide applicants (40% seats category) of the waiting list are hereby requested to report the Department of Zoology (Asutosh College Main Building) on 08.09.2017 between 11.30 A.M. – 12.30 P.M. Candidate who will be selected (on the basis of merit) shall have to take the admission on that very day (08.09.2017). Note: Admission is subject to verification of Original documents (B.Sc. 3rd Year Mark sheet, Address proof & proof of Date of Birth/Caste certificate & original bank Challan. Following candidates have been selected from the reporting list of 17.08.2017 for provisional admission to 1st year M.Sc. course in Zoology-40% Seats Category (2017-18). 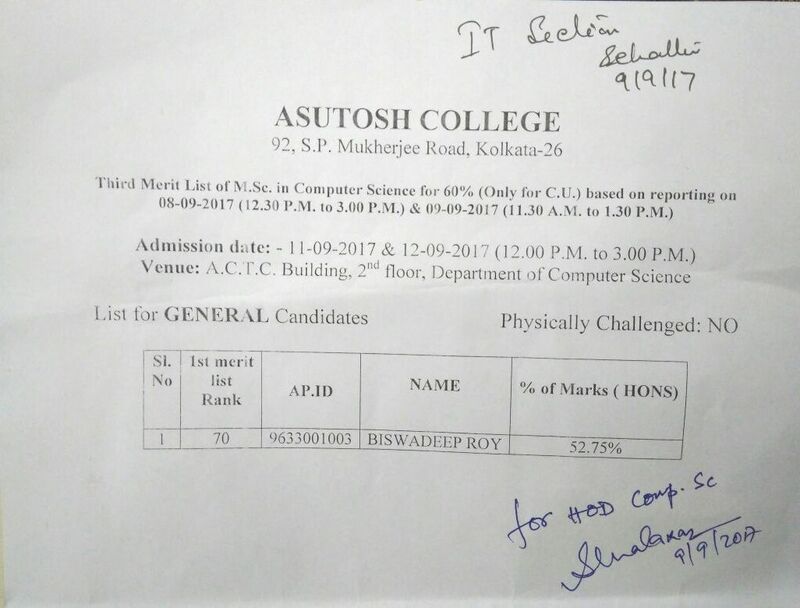 Selected candidates are hereby advised to take the admission on 21st & 22nd August, 2017 (12Noon-3 P.M.) at the Department of Zoology (Asutosh College Main Building) failing which their candidature will not be considered. If seats are available, 2nd MERIT LIST will be published on the basis of reporting list of 17.08.2017. All the bonafide applicants (reported on 17.08.17) are advised to follow the College website and keep in touch with the department in order to find out the possibility of their admission, if any. Bonafide applicants who appeared in the M.Sc. Entrance Examination’ 2017 on 05.08.2017 (Saturday) – for 40% seat category are hereby directed to REPORT to the Department of Zoology on 17th August, 2017 at Asutosh College Centenary Building (22, Kalighat Road, Kolkata-25), with Original bank challan and B.Sc. (Hons.) Final Year original Mark sheet as well as a photocopy of the same. General Category: 12 Noon-1.30 P.M.
Reserve Category: 1.45 P.M.- 2.45 P.M. ADMISSION will be strictly on the basis of MERIT from the candidates present on that very day and time. Note: Applicants name printed on the rank list will be verified with the original documents. Following bonafide applicants (60% seats category) of the waiting list (reporting held on 29.07.2017) are hereby requested to report the Department of Zoology (Asutosh College Main Building) on 08.09.2017 between 11.30 A.M. – 12.30 P.M.
Bonafied short listed applicants (on the basis of the Rank list for the candidates of Calcutta University only-60% seat category) are hereby directed to REPORT to the Department of Zoology on 29th July, 2017 at Asutosh College Centenary Building (22, Kalighat Road, Kolkata-25), with B.Sc. (Hons.) Final Year original Mark sheet as well as a photocopy of the same. General Category: 11 A.M.-12.30 P.M.
Reserve Category: 12.45 P.M.- 1.45 P.M. Admission against 1st Provisional Merit List in Environmental Science will be held on 19.8.2017 & 21.8.2017 from 12 noon – 3 p.m. at the Department of Environmental Science, Asutosh College. Candidates are requested to bring all the original necessary documents. The applicants whose names are enlisted in the M.Sc. Environmental Science Provisional Merit List 2017 are asked to report to the Department of Environmental Science, Asutosh College on 18.08.2017 between 11 a.m. to 12 noon with all necessary original documents. The final admission list will be published in the College Website at 4 p.m. on 18th August, 2017. Candidates appeared in the admission test are hereby informed to contact the department on 13.09.2017 at 1 pm. Admission will be according to number of vacant seats and score in the admission test.